Traveling with kids is amazing! An article was recently brought to our attention. It was on CNN and is titled, 5 rules of traveling with kids. Although I believe that some of the advice is accurate, the overall tone of the article was offensive and seemed to be targeting people in a totally different reality than most of the traveling families I have met and interacted with. First, I felt the general tone was not fair to children and really played them off as more of a nuisance than the pleasure that they are while traveling. In all honesty I wouldn't want to do this trip without our children. I wouldn't want to do any trip without them. They have been a challenge at times, don't get me wrong, but overall they help us to see the world in a way we might let pass by without them. They encourage us to tackle our fears, and help to keep life in perspective at all times. The CNN article seemed geared towards people that might not travel as much as we do and did provide some useful information, but I thought it was important to show the other side of travel with children. Completely not true. A young child may require diapers but really it evens out when you consider how small their clothing is. I have a 4 year old and he is perfectly happy making fun out of whatever is around us at any given moment. It is a fallacy that children need loads of toys to keep them happy, one we parents too easily subscribe to. A small bag of some favorite toys, legos, small stuffed animal perhaps is really all one needs. My 8 year old carries his own belongings, something he is proud of! My 12 year old carries more than me, and my 4 year old is responsible for his own toys. Better advice: Know your child and give them whatever they can handle. No 2, children have the same ability to cope with new environments. Do your best and be open to changing something that's not working! Children will surprise you if you have faith in them and let them take the lead sometimes. Now this one I can some what relate to. My 4 year old did struggle with the time difference when we flew to the other side of the world, yet with 5 different people it was bound to take a few days none the less. If you have a short amount of time for your trip I suppose this really could be quite an issue. We had no real time limit so that helped us relax a bit. Keeping the boys quiet while the other hotel guests slept was a bit of a challenge but we ate out late, went for walks, watched movies, and played some quiet games. Some of the most fun we had was being awake together at 4am giddy with exhaustion and battling out yet another killer game of Yahtzee! Better advice: Just go with it and don't worry ahead of time. Some people have very little issue with jet lag. Enjoy the unique time together. If all else fails follow these tips for jet lag! For starters, I think every place in the world has french fries, but the underlying tone here is that kids can't handle trying new food. We believe that it's a good thing to introduce them to new and interesting dishes. If they don't like something they will seek until they find something they do enjoy. Meanwhile children are learning valuable skills and pushing their limits. It is so sad to watch someone limit another's potential, especially a child's potential. To say all a child wants is fast food and mac and cheese is just a reflection on the parent driven, imposed limitations this child has experienced since birth. Better advice: Explain the projected meal options ahead of time. Assure them of a back up plan but also guide them to trying something new. Make it another part of the exciting adventure. There is no telling what our children may like or be willing to try! Don't expect failure or that is surely what you will get! This one sort of goes hand in hand with the first one and how many toys you need. I just don't think it is always necessary. I will not pretend that we don't have a bunch of electronics because we do. But I often find the boys just chatting or taking in the scenery. They use the electronics some and I am always glad I have them as an option particularly for my youngest, but a necessity...definitely not! I also agree that coloring books, legos or anything else that will make your child's experience more pleasant is a good idea to have on hand but the exaggeration of loads of luggage is a bit over the top. I assume it was meant to be witty, but it could also be construed as offensive. Better advice: Not really better, but just don't worry so much. Be prepared but don't go overboard spending loads of money and weighing yourself down in transit. Relax and know that you are doing your best and go with the flow, it will all be fine. I agree that under some circumstances strollers can be more trouble than they are worth. With that being said, in only about 1 month we realized that because of busy traffic and lots of walking, it would be best to take our chances with a cheap stroller. Our 4-year-old is capable of and wants to walk a lot of the time but when he is done and does not want to walk anymore I just cannot force him. At the same time he is just too heavy for me to carry or even to put in some type of sling. My husband puts him up high on his shoulders, but that only lasts a kilometer or two at most. So a stroller became our best option. I take a second to think about where we are going and sometimes don't bother with it. But we have not once said we wish we didn't have it as an option. Admittedly your mileage may vary depending on where you are, what you expect out of your children, and what you are willing to tolerate. I love ours and it was only $20! Better advice: Do what works best for you and your child. Research the area you are going and talk to people that have been there. They will be able to tell you if walking the streets with a stroller is possible or not. It was as if this writer has never traveled with kids but instead subscribes to the same thoughts as the "we are so excited our kids are back to school" crowd. Fear driven mentality where children are not placed as a priority but rather a distraction! Finally, our experience has shown that children are just as capable as us parents. Please know that a backpacking trip around India would be leaps and bounds more educational then it would be to spend a week at an all-inclusive resort! And it is more than possible, people do it ALL the time! The world is so big and full of new experiences, let your children explore them without your worries and fears getting in their way! It will be the best thing you've ever done! 5 Amazing Reasons To Travel With Your Kids! Please share this article using the tools below! Loved the "Better Advice" sections. You hit the nail on the head. I admire your family for getting 'out of the box' and following your dreams of traveling. I really like your advice on "Explain the projected meal options ahead of time". Safe travels. I always say, on the flight every second has to be accounted for, as in keeping the kids occupied. If they are busy, you get a great flight! Also, when we travel long on road trips, we always like to go around my baby's sleep schedule. It helps a lot. Excellent article! I agree that the CNN author is a part of the "so excited to get back to school crowd". I always feel so sorry for those parents. I think they are really missing out on the best parts of parenthood. I agree that traveling with kids can be a lot of fun. They allow us to see things in a whole new light. Getting from point a to point b can be tough, especially when traveling alone with young kids. 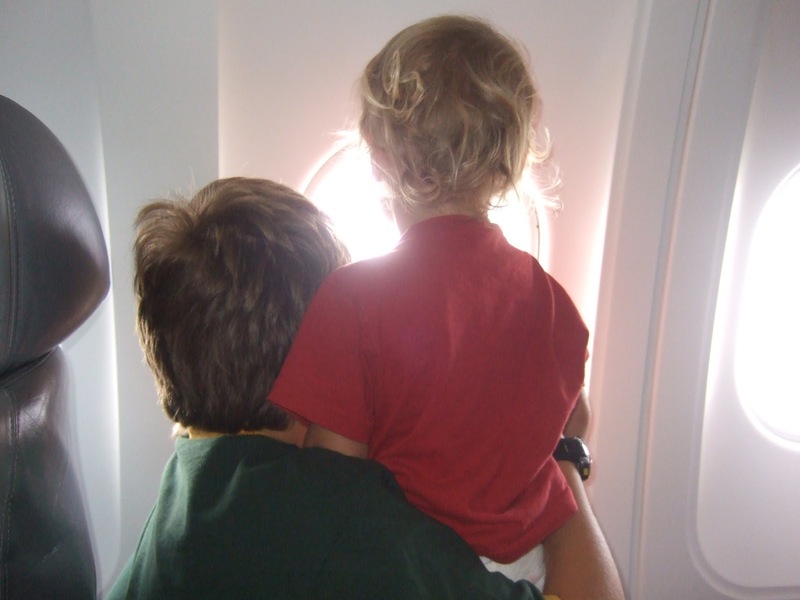 I launched a site called www.nannyintheclouds.com that will allow parents to match up with a babysitter already booked on the same flight as them. This should make traveling a lot easier for moms across the country. Check us out. I just hears a song lyric. "When I was a child I spoke as a child. I wish I could remember what I said." I like your point that travelling with children helps you see things you might have otherwise missed. I completely agree with you on the importance of accessing the individual situation, and being flexible. Makes for more enjoyable travel, and life too. I think the overall tone of YOUR article is to keep your kid's true needs in mind and couldn't agree more. When we try to shut our kids up, it usually backfires. Why wouldn't it? They have their own minds and needs and, frankly, NO one likes to be treated that way. Great point of view! Seriously. Our travels with kids are different than pre-kids. And we think it's better. We travel with our iPad, mainly for internet use for us, but also as a backup plan for our children. We've rarely pulled it out while traveling though, because our kids entertain themselves with simple things since they are 3 & 1. I'm sure they will come in more handy when they get older, but I'm happy for now. I like your article and about trusting your own child! Its true - find out what works for your family, and do what is best for each individual child. There is so much that was wrong with the CNNGO 5 Rules of Travelling with Kids article - I would like to know if the writer did any research before creating the list? Love the Best Advice sections. Sums the ideas up nicely. The author really didn't give kids or their parents much credit. It's sad, because so many families feel the same way. Our toddler continues to astound us with how flexible he can be when traveling. I just hope more families see the good of travel than the bad and get out there to see the world. Great tips. My children have always traveled well and even more so now that they are 7 and 10. It's because we've always done it and were prepared with entertainment, food, and knew that we'd have to do things at a slower pace. That CNN article was just irresponsible. I can't believe it was ever published. I know Monique, the saddest thing is that the CNN article will reach so many more people than the great articles written by the above group! Really hoping CNN gets wind of this and maybe reprints some of our articles to set the record straight. Anyone know anyone at CNN??? Yes! Have faith in your kids and let them have a responsibility of carrying and caring for their own stuff, choosing local foods off the menu, making their own choice of their personal entertainment while in route and taking lead for their own education ( while trekking through India) ! 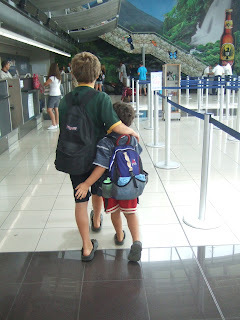 I travel with my kids all the time, it is a great big adventure with multiple learning opportunities. As a home school parent I do think I know my kids better than a public schooled kid parent would, so it's relatively easy for me to go over a travel plan with my kids and decide what each one needs to have with them and what trips and activities serve our family best. I hate when article and magazines and blogs tell families how to live, raise their children, travel etc. We are all individuals not clones. This one size fits all world is monotonous and boring at best, dangerous to each individual on the planet at worst. I always enjoy your articles you are on point as usual!! RIGHT ON! I took my 4 children (ages 10, 8, 4 and 3) on a two week excursion in the Pacific Northwest United States this Summer. They were downright delightful, everyone commented on how well organized we were and how well behaved they were---and it was because we had clearly expressed to them exactly where we were going, what we were doing there, and had even run a "going through airport security" practice drill. We took 2 large suitcases and two small suitcases for the 6 of us, and one of them was full of food and diapers. I just found your blog on the unschooled list, and I am loving it. It is a dream of ours to one day sell everything and just go traveling the world. We want to go to Ireland in four years, and no one seems to be able to grasp why we would want to bring along our children. I don't know why we wouldn't want to! Lindsay, thank you so much. Really that is exactly why I do it, I want to inspire others because this is honestly the best thing I have ever done. We love it and not for a minute regret the choices we made to get us here. Most people think we are crazy and that is fine, get out there and make it happen! Good luck and always feel free to contact me with any questions. Bohemian, I agree with all the points you made, but I believe that you have understated the arguements in favour of travelling with children. I backpacked around Europe as a lone parent of 5 year twins in 1999. They are now both confident and adventurous travellers, my daughter Holly can now prepare food in a way that is well beyond her years, she can perform the basics of flamenco that she learnt on train journey across Spain and my son Patrick is able to hand wash his own socks. I love this! I definitely think CNN was a bit over the top with their kid traveling rules. I think experiences can vary- and you are totally right that it depends on the parenting style and the children. When I went to Michigan last summer, flying wasn't the easiest part of the trip, but you get through it like anything else to get to the good part of the vacation- which everyone enjoys. Thanks for posting! i agree with your post!Traveling with kids all the time, is a great big adventure with multiple learning opportunities.